Chicago Region SCCA will be hosting 2018 Street Survival #2 at Route 66 Raceway in Joliet on October 14, 2018 from 9:00am to 4:00pm. The Street Survival schools are for teen drivers to learn car control. They help them learn how to make good driving decisions and react quickly. The format allows these young drivers to experience and practice different maneuvers they most likely have never experienced. Street Survival can stage these situations in a controlled environment. There will be several classroom sessions that cover making good decisions and defensive driving. Then student will be paired with a Street Survival trained car control instructor that will be in the car with the student during all of the stations. There will be several stations that focus on one aspect of car control at a time as well as a station that combines several elements. The Street Survival is a fantastic program that is working hard to help out teen drivers be safer and more prepared for the challenges and dangers that they will face on our roads. Please spread the word so we can reach out to the teens. With the support of the Chicago Region SCCA, Route 66 Raceway and Tirerack we can continue the success we have accomplished. If you can help staff this event, please contact the Chicago Region office. 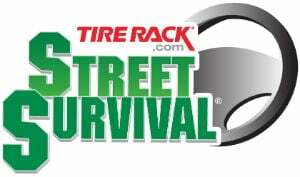 Register for Street Survival at MotorsportReg.com.